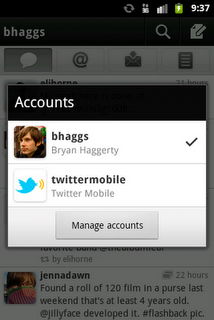 Twitter for Android now comes with push notifications and the ability to use multiple accounts. The latest version of Twitter application for Android (2.1.0) includes features that most requested and anticipated from Android community. The main feature is the push notifications. 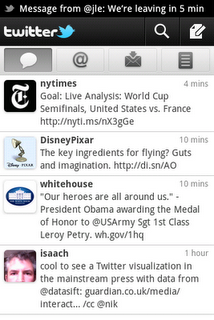 With Push Notification Android users allowed to directly receive immediate notification of Twitter updates right away. To enable push notification on Twitter go to Account Settings, select Automatic refresh and then choose to receive notification of updates for both DM (direct messages), @ mentions (from people who were followed or anyone else) and Tweets. It also comes with ability to use 'multiple accounts', which allows user to log on into multiple Twitter accounts simultaneously without having to login and logout. Twitter account will always active and the switching from one account to another account can be done flawlessly. Another changes in this application are a new display home screen, widgets, and also some bug fixes. Twitter for Android can be downloaded at Android Market.